Following the invasion of Norway, Bf109s of 4./JG77 receive routine engine maintenance at a forward airfield during the summer of 1940. Overhead a flight returns from a fighter patrol over the recently occupied territory. Richard is regarded as one of the industry's best pencil artists and this superb piece is completed in his trademark combination of pencil with color highlights on buff paper. ​Each print is individually numbered and personally signed by the artist along with an iconic Luftwaffe Fighter Ace: Leutnant HUGO BROCH Knight’s Cross / 81 victories He flew Bf109s & Fw190s with JG54 becoming one of the unit's foremost Aces. 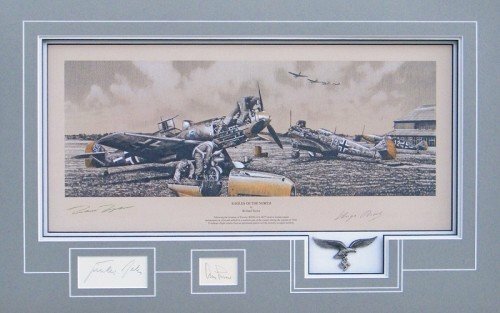 Each print in this three signature edition is conservation matted to include reproduction Luftwaffe Wings and the original pencil signatures of two legendary Luftwaffe Aces: Generalleutnant GÜNTHER RALL Knight’s Cross, Oak Leaves & Swords / 275 victories He flew Bf109s & Fw190s with JG52, and JG300 becoming the third highest-scoring Ace in history. Generalleutnant ADOLF GALLAND Knight's Cross, Oak Leaves, Swords & Diamonds/104 victories The legendary Fighter General flew Bf109s & Me262s with JG27, JG26 and JV44. Every remarque is a work of unique detail, created in pencil, embellished with subtle colour highlights, hand drawn in the lower margins of the print. Each remarqued print is then matted to include the original signatures issued with the Collector's Edition.